Culture and tradition are something that is very valuable and must always be maintained. Tradition is a witness of the length of history that has been traversed by a nation or country. And sometimes, the tradition is considered to result in something bad happening if it is not done. In accordance with their respective beliefs. Many traditions are still being carried out today. Like religious holidays, death ceremonies, and also wedding ceremonies. Traditions usually contain various hopes and prayers. One country that still maintains various traditions is Russia. Russia is the largest country which certainly has many republics. And every republic or city has a distinctive tradition that is different from other regions. One of them is Dagestan. The Dagestan Republic is the largest republic in Russia located in the north of the Caucasus. And the majority of the population of Dagestan are followers of the Shafi’ite sect. And it turns out that religion greatly influenced adat in Dagestan, one of which was adat in marriage. Marriage is something very important in human life. Of course marriage cannot be held carelessly, without any customs at all. as well as the Muslim community in Dagestan, Russia. They still carry out various kinds of unique and interesting traditions in the wedding ceremony. And in this article, we will provide a complete explanation for Russian lovers about the wedding customs in Dagestan. 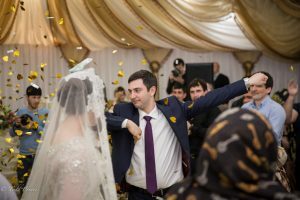 Here are 7 beautiful traditions of wedding customs in Dagestan, Russia. Marriage is a very big and valuable moment for the Dagestan people. If someone is holding a wedding, all the people in the mountain villages stop all their activities and participate in celebrating the wedding. The workshop was closed, as well as the craftsman’s booth. Dagestan is an area with a livelihood as craftsmen such as vases, jars and other decorations. And they are willing to close their booth to celebrate the wedding day. Everyone must help prepare for the bride’s big day. Village seniors are in charge of sharing responsibility with each other. Like who will share invitations, buy food, choose musicians, and decide where the wedding will take place. The Dagestan community has considered the interests of one person as their common interest. Brotherhood is very high in this area. They are very happy to help each other. Likewise at the wedding. And a large wedding in Dagestan attracts tourists who don’t expect such a large tradition. Very unique, right? It must be very happy to have neighbors like Dagestan residents. Because it is considered a big celebration, Dagestan residents not only celebrate the wedding one day one night, but 3 days. And sometimes, not only are there lovers who are married, it can be more. The 3-day wedding celebration was welcomed by all the Dagestan people and all the residents came all the way to witness the wedding. When it gets dark, the male relatives and the groom walk to the house of the female pegantin carrying a torch. The torch is the only light on the road because there are no lights on in the mountain village. When they arrived at the bride’s house, they met a woman’s family, sat together while chatting and jokingly waited for the party. While the bride and the female relatives gather in the bride’s room. The most interesting part of the celebration is on the second day. When night fell, all female relatives and families brought a wedding gift and came to the bride’s house. They give gifts that are very unique, and usually are the work of their hands, various crafts. Women carry jugs, rugs, cloths, glass utensils, and all the new bride’s needs in the household. All female relatives are happy with the wedding and accompany the bride waiting for the bridegroom to come to pick her up. When it gets dark, the male relatives and the groom walk to the house of the female pegantin carrying a torch. The torch is the only light on the road because there are no lights on in the mountain village. When they arrived at the bride’s house, they met a woman’s family, sat together while chatting and jokingly waited for the bride to finish dressing. After the bride is dressed, the whole crowd raises the torch and guides the bride to the groom’s house. After arriving at the groom’s house, the party begins with various dances. The bride’s costume is one very unique tradition. In addition to using traditional dresses, the bride also uses a cloth head cover so she can’t see it at all. And when heading to a man’s house, the bride is guided very carefully. This one tradition is also very interesting. Because marriage is a big day for the Dagestan people, they have a special way of congratulating the bride and groom. The whole house lit a campfire as a symbol of congratulations. And this bonfire helps illuminate the path to the groom’s house. If one of the campfires is not in one of the houses, it means that the bride’s family or groom’s family is in serious conflict with them and there will be no bonfire at all. but this certainly rarely happens. Before entering her room, the bride must roll round flat bread. If flatbeard falls with a rising pattern, then that’s a good sign. And if the pattern goes down, the bride and groom will face a big problem later on. To prevent flat bread from falling down, there are some grandmothers who sit at the entrance controlling flat bread if something goes wrong, and they push it gently to fall with a rising pattern. Very unique, right? Those who are 7 beautiful tradition of wedding customs in Dagestan, Russia. The traditions that are still carried out by Dagestani are truly unique. They are a nation that highly values ​​the meaning of brotherhood and lives peacefully and happily. You can see that from the way they celebrate the wedding day of one of the residents of the area. They are very happy to help and be happy. Of course, this is very inspiring.